No one following the Russian-collusion and related dramas should be in any doubt about the steady flow of the balance of damaging evidence away from Trump and on to his accusers. It is clear that the hierarchy of the FBI and analogues in the Justice Department and intelligence services, horrified at the thought of a Trump victory though confident it would not occur, took liberties — in the soft treatment of Hillary Clinton's email and uranium problems, and in abetting the Clinton campaign's effort to smear Trump with the Russian-collusion argument. As the parallel investigations and diluvian leaking have unfolded, the anti-Trump Resistance has received a series of gradually suppurating mortal wounds. The Steele dossier was commissioned and paid for by the Clinton campaign; over a hundred FBI agents and Justice Department lawyers expected Hillary Clinton to be charged criminally, and President Trump was correct in saying conversations by his campaign officials had been tapped, a claim that was much ridiculed at the time. Deputy FBI director Andrew McCabe testified that the Steele dossier was essential to obtaining a FISA warrant on a junior Trump aide (Carter Page), and McCabe and former director James Comey's rabidly partisan helper Peter Strzok, and his FBI girlfriend Lisa Page, texted suggestions for influencing the FISA judge in the case. The judge recused himself, voluntarily or otherwise, after granting the warrant. Mueller set up his "dream team" of entirely partisan Democrats; McCabe failed to identify to the Bureau his wife as a member and beneficiary of the Clinton entourage and political candidate in Virginia; and the fourth person in the Justice Department, Bruce Ohr, met with Steele, and Mrs. Ohr helped compose the Steele dossier. 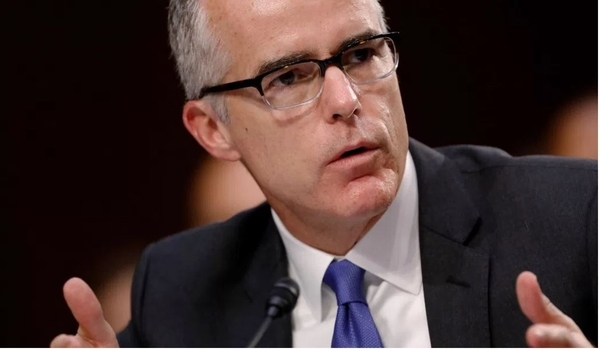 The Justice Department inspector general, Michael Horowitz, whose report is expected imminently, showed the FBI director, Christopher Wray, findings about Andrew McCabe's conduct that caused him to retire McCabe prematurely. The Office of Professional Responsibility (OPR), one of the few centers of unquestionably ethical and nonpartisan conduct in Washington, advised the attorney general to fire McCabe. McCabe himself was reduced to mind-reading in his attack on the president on Friday night, claiming Trump's real motive was to weaken the Mueller inquiry. Trump didn't fire McCabe. McCabe scuttled his own credibility. Former CIA director John Brennan's outburst on Saturday indicates that the Resistance is cracking up. He tweeted to the world, but specifically the president: "When the full extent of your venality, moral turpitude, and political corruption becomes known, you will take your rightful place as a disgraced demagogue in the dustbin of history." It was seemly that someone who voted for Gus Hall, the American Communist leader, for president in 1976 would invoke Marx. But he went on to accuse Trump of trying to destroy America. Former National Intelligence director James Clapper has been routinely announcing, at home and abroad, since shortly after Inauguration Day, that the Russian-collusion story was a greater scandal than Watergate. Brennan didn't mention treason in his tweet — he seems to have given up on collusion and to be focused on Stormy Daniels and Trump's financial career. (Anthony Scaramucci, in his drunken interview with The New Yorker, was more rational than Brennan.) Brennan and Clapper were improperly leaking partisan information for months and Clapper lied to a congressional committee. The immolation of McCabe has resulted in a moving of the focus to Mueller by both pro- and anti-Trump forces, for different reasons. The Democrats and their media allies desperately want Trump to fire Mueller, to keep the impeachment canard alive. The president will not oblige them, though he has made the point that there was no excuse for this inquiry, as there was no prior crime nor any evidence of collusion, and that it was weakly and reflexively created by Deputy Attorney General Rod Rosenstein after Attorney General Jeff Sessions gave a mistaken answer on a small Russia-related question at his confirmation hearings and recused himself on anything to do with Russia. Mueller is there only because Comey, after he was fired, illegally leaked a contested memo of a conversation with the president, as he acknowledged without embarrassment at a congressional hearing, to force the appointment of a special counsel on Russian matters (this despite his and McCabe's assertions that there had never been government interference in the Russian investigation). Although Comey disparaged the Steele dossier, he and McCabe were complicit in allowing that dossier to be used as the basis for an illegally obtained and renewed FISA warrant against Carter Page, and for precipitating the Mueller inquiry. It is a reasonable supposition that what is terrifying the Resistance now is that the real scandal (as a number of us have been laboriously reciting at intervals for more than a year) is the corruption of the FBI and the Justice Department. The best possible outcomes of this controversy would be the reform of criminal procedure and the end of the criminalization of political differences. The entire U.S. criminal-justice system is an anthill of oppressive fraud where prosecutors win 99 percent of their cases, at least in part, 97 percent without a trial, as Mueller is proving by throwing monstrous charges against his victims and settling for guilty pleas to trivial and technical counts to extract catechized and rehearsed inculpatory testimony with immunity for perjury. No one should imagine that General Michael Flynn is the sole victim of this. Mueller was there for the shameful persecution of Senator Ted Stevens, and has been in the vanguard of the mass-destructive weaponization of the American prosecutocracy. (The U.S. has 5 percent of the world's population and 25 percent of its incarcerated people.) The immediate problem is not draconian severity but the capricious abuse of the practically unlimited power of prosecutors — and especially the pandemic of partisan infection of the federal law-enforcement and intelligence apparatus. There had been no discussion of the impeachment of a presidentfor over a century until Watergate. Richard Nixon had the authoritarian Truman-Eisenhower view of what a president could do under the cloak of national security, and by the time his overzealous aides had propelled the White House into the crosshairs of heavy Democratic artillery, he suddenly froze and had no idea how to get through it. Reagan blundered for reasons of compassion for the American hostages in Lebanon into the Iran-Contra mess, but it was never an impeachable offense — just the Congress trying to run foreign policy. Reagan was popular and near the end of his term, and his national-security adviser, Admiral John Poindexter, took the bullet. (He was acquitted on appeal.) Bill Clinton didn't commit impeachable offenses either, and was shafted by Republican congressional majorities, but he waged a skillful-public relations campaign, and enough Democratic senators supported him so he could finish his term.